The governing body for high school sports in Illinois — which has come under scrutiny over the salaries and pensions it pays its staff and over whether it’s sharing enough of its income with schools — reported a 24 percent increase in the salary and benefits of its top executive, who plans to retire early next year, newly obtained records show. The Illinois High School Association said executive director Marty Hickman’s compensation during the 2013-2014 school year totaled $372,293 — up $73,007 from the year before, according to the private, not-for-profit group’s latest filing with the Internal Revenue Service. That included $155,375 in what the IRS labels “deferred compensation” for Hickman, in addition to a base salary of $202,676. Hickman’s base salary put him in line with an elite group of 150 Illinois school administrators whose base pay also exceeded $200,000, state records show. It’s also comparable to Illinois state education Supt. Tony Smith’s base salary of $225,000. But unlike Smith and those other top-paid educators, Hickman’s contract and other terms of his employment are held in secret, except for minimal details the IHSA is required to report on its highest-paid employees in the yearly report that not-for-profit groups have to file with the IRS. Also secret are the sponsorship, TV and other deals made by the IHSA, which has faced questions from Illinois lawmakers about whether schools should get a bigger share of the nearly $11 million the organization collects each year. The IHSA could make all of that public. But it doesn’t, saying it doesn’t have to comply with the state’s Freedom of Information Act because it’s a private organization — even though more than 80 percent of its 800 members are taxpayer-funded public schools; its 10-member board includes public school principals; and it governs eligibility and other key issues affecting student-athletes. A Cook County judge recently upheld the association’s position. That leaves only the group’s yearly IRS filing and an accompanying audit — both of which must be provided to the Illinois attorney general’s office — along with its publicly distributed annual report to provide insight into how the organization is run. Based on those records, the Chicago Sun-Times reported last year that the IHSA spent $3.1 million on salaries and benefits in 2012-13 — up 21 percent from 2011-12 — even as profits from its marquee event, the state boys’ basketball tournament held in Peoria, had fallen. • IHSA spending on salaries, health insurance and retirement-related costs decreased 20 percent between 2012-13 and 2013-14 — a decrease that was the result of it cutting its “pension plan accruals and contributions” in half. Still, the association reported spending $2.5 million on 23 employees, seven who were paid more than $110,000 each in salary and benefits. • In all, the IHSA — whose headquarters are downstate in Bloomington — took in about $10.7 million in revenues. It reported getting $5.5 million from ticket sales at playoff and championship events. Under its revenue-sharing formula, the association paid $2.6 million out of that $5.5 million to the hundreds of schools that hosted those events, and it kept $1.7 million. The remaining $1 million went to pay referees, umpires and other officials. • An undisclosed number of people were paid $593,379 from the association’s $9.3 million pension fund, which was frozen as of 2008 because of escalating costs. The IHSA paid $300,000 into the pension fund in 2013-14 and is expected to pay $400,000 into it this year. • A second fund set up to provide “supplemental retirement benefits to certain employees” whose pensions were frozen drew a $100,000 contribution. That fund paid out $35,170 in benefits. • The IHSA spent a total of $102,753 on expenses related to a 401(k) plan for other employees. 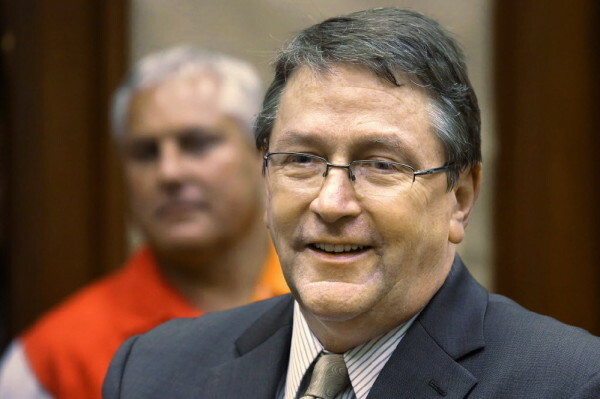 Hickman, who started work at the IHSA in 1991, has said he plans to retire in January 2016. Most recently, he’s been helping defend the association from a potentially costly class-action lawsuit that accuses the group of not doing enough to prevent concussions in football. In a letter with its annual report, Dan Klett, the IHSA board’s president, praised Hickman’s leadership, especially during legislative hearings on the group last year. During the first of those hearings, held in May 2014, there were shouting matches between lawmakers and IHSA supporters. The hearings took place after the House passed a resolution to examine IHSA operations. The Illinois Press Association, whose members include the Sun-Times, and the Illinois Broadcasters Association, supported that effort. The IHSA keeps the bulk of the money from some events that schools host, the Sun-Times reported last year. It offers guarantees to schools on how much they’ll get to host playoff and championship events. Under the formula establishing those guarantees, the association loses money when it pays schools to host events that bring in little or no ticket income but makes money — sometimes five-figure sums — on sports that draw big crowds. For example, the 2013 boys basketball Class 4A sectional, held at Bolingbrook High School, netted $24,706 from ticket sales, according to records obtained from Valley View District 365U. The IHSA guaranteed Bolingbrook $2,300 to host the three-day event and paid referees a total of $706.50. The IHSA kept 80 percent of the net — $17,351 — with the school getting only $6,648. IHSA officials and supporters have defended the group’s arrangements with schools, noting that the association doesn’t charge schools membership dues, that membership is voluntary and that a committee of athletic directors and principals designed the revenue-sharing model. Following the Sun-Times stories, the Better Government Association sued the association, arguing its records should be made public under Illinois law because it “performs a governmental function” and generates income “from events involving predominantly public schools.” Cook County Judge Mary L. Mikva dismissed the lawsuit in April, a decision the BGA — a private, not-for-profit organization that acts as a watchdog on government — is appealing.